Barry Lynn's fourth album for Planet Mu effectively sees him disengage with Dubstep and embrace the esoteric strands of Jazz, Techno and Electronica which always richly informed his music. It's no surprise really, given that his previous album 'Arecibo Message' and singles on Kinnego Records have been moving towards a finer balance of electro and acoustic instrumentation for the last few years. 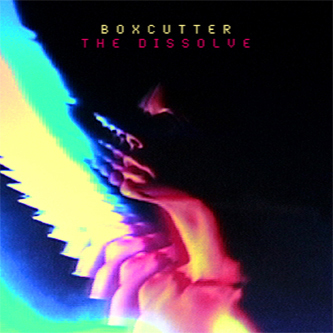 Worry not though, he's not lost his head up his arse with over-egged "experimentalism", the 13 tracks of 'The Dissolve' are still definitively Boxcutter, but now rubbed with that same pseudo lo-fi aesthetic as Actress' 'Splazsh' LP to sound more worldly, confidently expressing a scuffed, more vulnerable sense of soul. Vocals feature prominently, including three pivotal tracks with Brian Greene, from the fonky, Detroit-vibing 'All Too Heavy' to the heady title track, full of dextrous jump cuts and deliciously smudged pop glow, or the Sa-Ra-esque cosmic burner 'Ufonik'. For us the highlights have to be the Street Fighter-referencing avant-Bashment of 'Cold War', the yearning Yacht-boogie vibes of 'Passerby' and the 'ardcore Juke-Dub fusion of 'Allele', but we're quite certain everyone will have their own percy. Most importantly, this album proves his charming ability to absorb and assimilate outside influences without compromising his personal style, and still sound completely on it. Recommended!